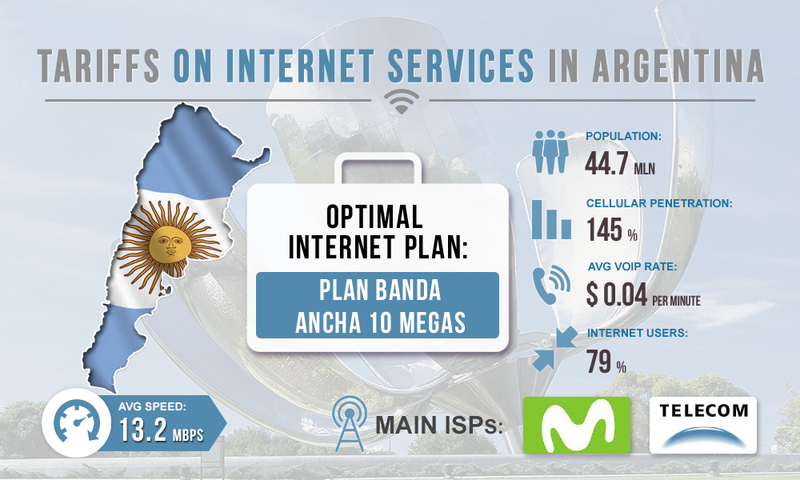 The Internet services sector is well developed in Argentina, with broadband penetration being one of the highest in Latin America (79%, which is about 34.7 million connections). In recent years, the quality of services has increased significantly, as well as the average Internet speed (13.2 Mbps). Let discuss the prices of the local providers for the Internet connection for earnings on termination. The competition in Argentina's Internet services market is somewhat limited; now the main Internet providers are Movistar and Telecom Argentina. Nevertheless, Internet rates are quite affordable here. Let discuss the average prices for the Internet in the country on the example of Movistar. Plan Banda Ancha 10 Megas. Cost - $19 per month. Download speed - up to 10 Mbps. Plan Fibra 100 Megas. Cost - $22 per month. Download speed - up to 100 Mbps. Plan Fibra Simetrico 300 Megas. Cost - $30 per month. Download speed - up to 10 Mbps. Any of these packages will be perfect for voice termination. However, the best choice would be Plan Fibra 100 Megas. It is not much different in cost from the Plan Banda Ancha 10 Megas, while providing for higher speed. In addition, the fiber-optic Internet is considered the most stable, and the stability of the Internet connection is very important for effective VoIP termination. Paying only $ 22 per month, you can ensure uninterrupted operation of a gsm gateway dual sim or another gateway for any number of channels.